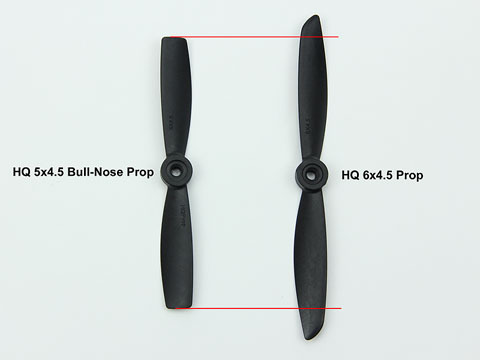 The HQ 5x4.5 Bull-Nose props have the same blade shape as the HQ 6x4.5 props, but with 1/2 inch cut off the tips to create the 5 inch diameter. These props provide much more blade area than a conventional 5 inch prop, providing additional thrust for smaller quad frames that have limited prop clearance. The photo below shows an HQ 5x4.5 Bull-Nose prop next to a standard HQ 6x4.5 prop. Both props have the same blade shape, but the 5x4.5 is molded with the prop tips cut 1/2 inch shorter than the 6x4.5 prop.